1. Make copies of joint tax returns. You can order computer transcripts for free from the IRS with form 4506-T or call 800-829-1040. Or you can get copies of the returns and W-2’s for $39 per return by filing form 4506. 2. Order your credit reports from Experian, TransUnion and Equifax. 3. Close joint accounts or ask your credit card company to convert them to individual accounts. 4. Consider selling the house. 5. Remember you may still be liable for debt to the creditor even if the divorce decree makes your spouse responsible for payment. 6. Do not assume that you will automatically get 50% of the assets. 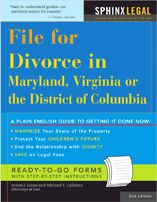 Maryland, Viriginia and DC are equitable distribution states. Equitable means fair not equal. A wise man Divorce Quote What Makes a Marriage Work?